Ashburton District Council, Water Safety New Zealand irrigation companies, MHV Water, Barrhill Chertsey Irrigation, and Ashburton Lyndhurst Irrigation, are pushing the importance of adult supervision around water.
. . . In the last 10 years, there have been 58 preventable toddler drownings in New Zealand. As a vibrant farming community, the Ashburton District has many water races, irrigation ponds, streams and rivers, most of which are not fenced or restricted, and many are often on private properties. These waterways can pose a deadly threat to unattended children,” Ashburton District Council Chief Executive, Hamish Riach explained. “It is not realistic to expect every waterway in rural areas to be fenced. With so many potential drowning hazards around, it is vital that everyone is keeping a vigilant eye on their young ones at all times. The Council is proud to be working in partnership with local irrigation companies and Water Safety NZ to help reinforce this crucial message.” . .
One of our staff rang a few years ago to say his pre-school daughter was missing. The house was fenced and gated but if she had managed to get past those barriers there were troughs and an effluent pond nearby which could have claimed her life. Eight of us began searching and were on the verge of calling emergency services when the child’s sister found her, curled up in the bottom of her (the sister’s) bed. That story had a happy ending, too many do not. 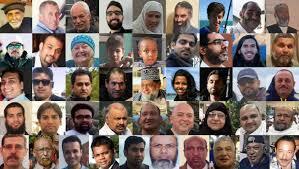 The roll call of the 50 victims of the Christchurch mosque terror attacks show 46 men and four women. The Muslim requirement for women to worship in a separate space from men cost the lives of more men and fewer women. That isn’t an argument in favour of discrimination or of women’s dependence. Widows of the mosque shooting victims are struggling in the wake of the attack. Some of the women needing support can’t drive and don’t hold jobs. Shakti, a group helping women, has identified 13 families so far where women now facing life as sole providers. Some of them are very young, with young children and new to the country. Shakti councillor Shila Nair says some women don’t hold a current license, making ordinary tasks more difficult. “That kind of increases their difficulty by quantum leaps actually because driving is very essential to get to the shops and other places,” she told Newshub. Others have been in co-dependent relationships and are struggling with everyday tasks. Nair says she visited a widow who doesn’t know how she will adapt. “She told me, ‘How do I manage? Because I’ve never even gone out and done shopping on my own. '” . . The outpouring of aroha and sympathy and the show of compassion in the face of evil and tragedy have been heartwarming but most of us are already turning back to our normal lives. But normal isn’t normal any more for the families of victims. ACC will provide some financial assistance but the women who have been left without husbands will need more practical help.
. . . The Monkees – Davy Jones, Micky Dolenz, Michael Nesmith and Peter Tork – were brought together for an American TV series in 1966. As well as playing instruments for the band, Tork also sang on many of the tracks. . .
You are currently browsing the archives for the life & death category.